Not everyone owns an iPhone! Some people like myself are long time Blackberry users. 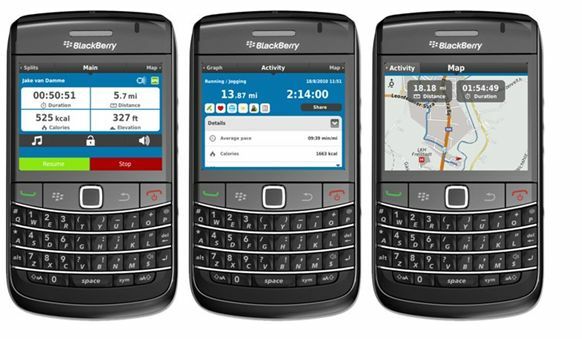 While I have covered iPhone Apps in past articles, I’ll share the limelight and cover running Apps for Android and Blackberry users. Like Freelap, you can’t improve what you don’t measure. runtastic is aimed for the middle and long distance runners who run mileage. It lets you measure all the necessary data to optimize your workout results – and compare yourself with past runs or even your friends. With runtastic you can measure just about everything you need and more: the app automatically records elapsed time, distance, calories burned, speed, elevation and tracks exercises via the onboard GPS and through satellites. This lets you analyze every step you take, compare your routes, progress and speed and of course how many miles you’ve run! Besides analyzing and tracking your progress, runtastic is your ideal training partner, following you everywhere and allowing your friends to cheer you on – with the runtastic live cheering function. Your friends can monitor your real-time progress and support you. This is what I do when my friends run marathons and ultra marathons. You can even use to set a specific target pace or speed for interval training.